Ulster utility back Will Addison. Will Addison has been ruled out of the rest of the season for Ulster following a back operation. Addison joined Ulster from Sale last summer but has not played since January as a result of the injury. 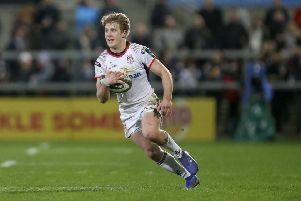 The 26-year-old utility back, who made his Ireland debut last November, is aiming to return to full fitness in time for pre-season, said an Ulster Ruguby statement. Ulster centre Stuart McCloskey is also a doubt for the vital Pro14 game against Edinburgh at Murrayfield on Friday. Ulster are second in the Conference B with two rounds of fixtures to go in the regular season, although both Benetton and Edinburgh are within three points of the Irish province.